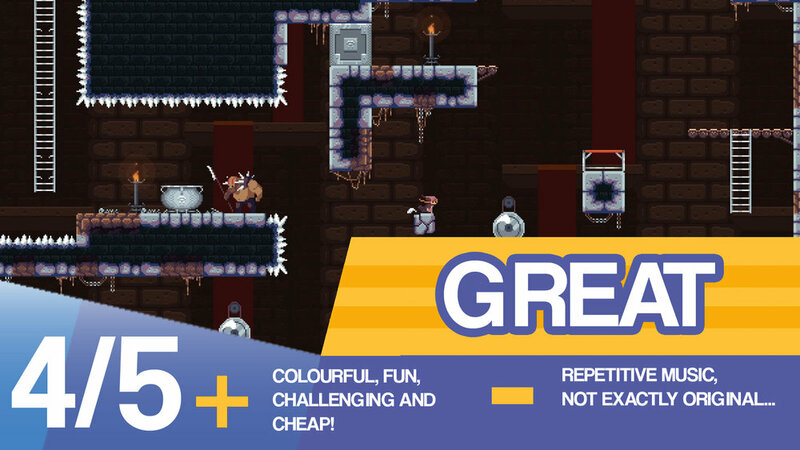 Death Fungeon by Ritual Games is the latest 8-bit style puzzle platformer that has elements of classics like Super Meat Boy and Prince of Persia and combines them into a £1.99 little packet of fun(geon). There’s not a story as such, it just plonks your little mediaeval sprite in a seemingly endless dungeon and challenges you to jump and puzzle your way out. You have no weapons, spells or gimmicks, this is purely about your running and jumping abilities as a player. The action takes place flick-screen style, with ladders and platforms for you to traverse. It starts you off easy, and introduces the challenges at a good and steady pace. There’s infinite lives, no time limits and when you die it starts you back at the beginning of the same screen you died on. The game also auto saves each screen you enter so you can leave and come back and not lose any progress. This makes an ideal game to play in short bursts, and also makes you want to keep coming back to see just how much further you can get. The puzzles in the game often revolve around getting past the large ogre-like guards. They have 4 stages of alertness, from asleep to running around angrily, which is heralded by the blowing of a suitably mediaeval horn. There are large cauldrons for you to hide in, but these only work when the guards are not alerted. Later hazards include the usual spiked pits and walls, circular saws and lava pits, with trampolines joining the ladders and ledgers to enable you to get around. The graphics are nice and colourful, and even though you are in a dungeon there’s enough variety for it not to look too samey. Music is just one tune on repeat but you can always turn it off in the menu. The controls are tight, and when playing on a joypad I experienced no issues, which is vital for a game often requiring precision jumps and quick changes in direction. This game is an unashamed basic platformer with bright colourful graphics, tight controls and solid gameplay. It’s not exactly original, but is a great flashback for those of us old farts who remember when 8-bit was new, yet challenging and fun for those who wouldn’t know a Commodore from a commode. Older PostTom Plays Shenmue (PS4) ...continued! - Let's look for Sailors!